the press wrote about his TRISTAN after his spectacular debut in Amsterdam with Simon Rattle, a role which he has personified worldwide in more than 100 performances e.g. in the Hamburg State Opera, at the Gran Teatro del Liceu Barcelona, the Frankfurt Opera, the Brisbane Festival, at the Teatro Verdi di Verona, the Teatro Regio di Torino, in Santiago de Chile, in concert performances in Montreal, at the Luzern Festival with Maestro Claudio Abbado, as well as with the BBC Symphony Orchestra London with Donald Runnicles (published by Warner Music). He rerepeatedly portrayed Tristan at the Bavarian State Opera Festival in Munich and at the Summer Festival of the Bavarian State Opera. 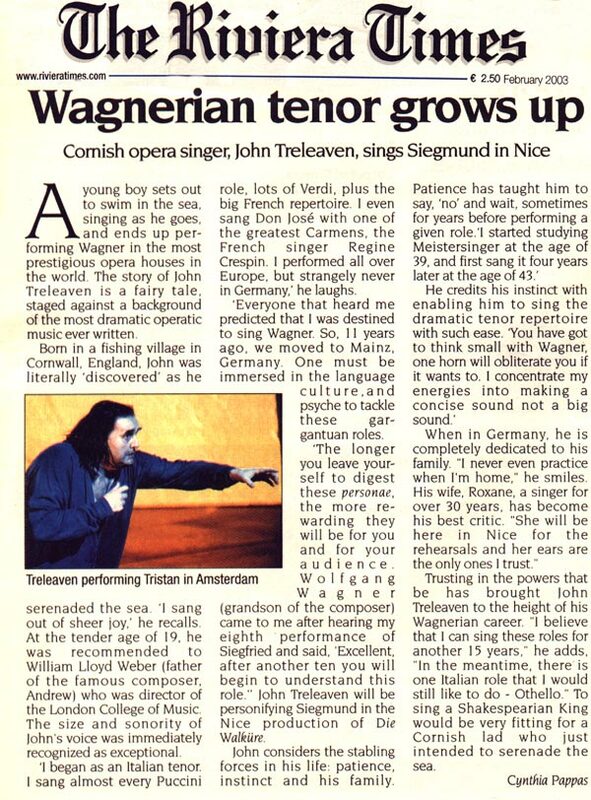 Moreover, the Cornish tenor convinced both audience and press with his TRISTAN interpretations at the Vienna State Opera, the Los Angeles Opera and the Opera House Zurich. „John Treleaven mastered this difficult part with profound highs and lows, played the fiery minstrel and the penitent sinner with complete commitment of voice and body.